I have a set of coils with the spark plug wires for an 88 Wing. Coils are the same as 97 but only some wires are the same according to part numbers, but still might work okay. The wires on 88 could be shorter or longer..... i don't know. If you need coils let me know. Wires will be attached so if they are the right lengths or not they will be included anyhow. $20 plus shipping. You need to connect Hose#20 directly to the Fuel Filter #2, thereby by-passing Hose#17 and the auto shut-off valve#4. It's easy... takes all of 1 minute, once you've removed the plastic radio housing. Great! Hold on to the coils for me in case I need them. As long as the coils are the same, then that'll be just snappy. As for the wires, I'll will order new wires and end-caps and assemble that myself. Right now, the coil is on hold as I may have found the problem. I've learned that my fuel petcock is malfunctioning and this may have been the reason for my momentary engine slow down on Thanksgiving Day. I decided to check the petcock today by disconnecting the vacuum line to the valve, and plugging the vacuum line. I then connected a vacuum pump to the petcock valve but did not apply vacuum. I started the bike and it just kept on running. Unless I'm in error, when vacuum pressure is applied to the valve, the diaphragms are pulled back to allow fuel to port through the valve and into the carbs. When the engine is shutdown, vacuum is lost and the diaphragms in the valve should close to prevent fuel travel. So it's not shutting off fuel flow, and might even be limiting fuel flow. Additionally, the failed valve might be the reason for the gas smell I get sometimes after shutdown; it is probably leaking somewhere that I do not see. With regards to deleting the valve, wouldn't this be a bad thing? I would assume deleting the valve would allow fuel to be gravity-fed from the filter and into the carbs. Granted the float needles are supposed to prevent this when the needles are seated and thereby preventing further fuel from entering. But we all know that float needles are not a perfect mechanism, and I'd think it would be better to have a fuel shutoff control. 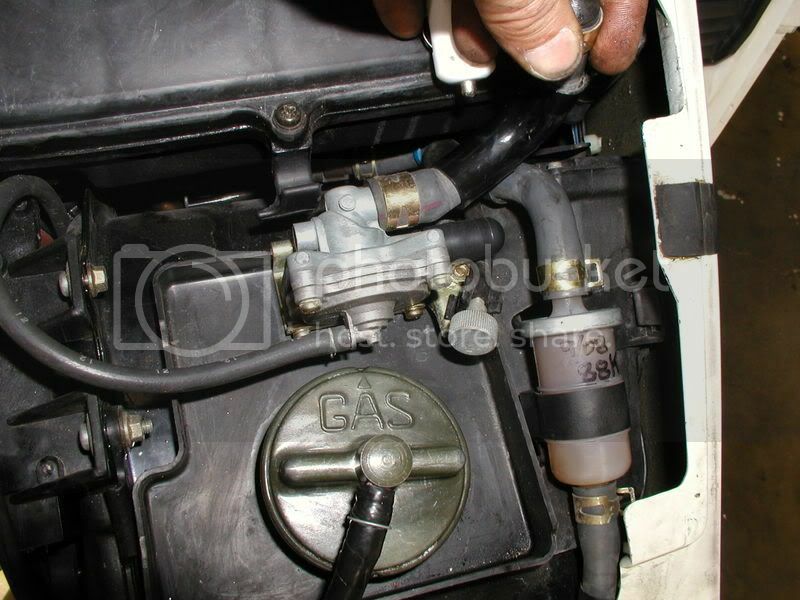 Looks very easy to do; just basically removing the main fuel line from the valve and connecting it directly to the filter. Have you done this already? Ever noticed any leaks or engine-flooding? I like the electric petcock idea, but I'll stick with stock. I haven't pulled the valve off yet (might do that today). But the way it's acting, I suspect the metal seal bushing is likely stuck and unable to slide in or out. It passes the vacuum pull test without losing vacuum pressure. But the valve itself is not shutting off the fuel when vacuum pressure is released. And so I suspect it is also not allowing full fuel flow as well, but only enough to allow the engine to run. Naturally under high RPM loads, more fuel is pulled through the valve. But below 2,000 RPM, I think their might be a minor starvation issue. I read of another GL1500 owner who had the same symptoms as mine; jerks under 2,000 RPM and would often have a gassy smell after shutdown. Turns out it was his petcock. Even so, I still think I have a carb-float needle issue on the left carb since it appears to be the left intake manifold that sometimes gets flooded after shutdown. And I still want to remove the coils and wires to ohms test them, and inspect the coils for possible cracks. We are headed to D.C. in May for a Veterans rally so I want to make sure the bike is 100%. Naturally under high RPM loads, more fuel is pulled through the valve. But below 2,000 RPM, I think their might be a minor starvation issue. Nothing "pulls" fuel through the valve, the pump pushes it. It would starve more at higher RPM if it wasn't getting enough flow. I used a poor choice of words. I think (just a theory) that the valve is opened just enough to allow the engine to run. But under higher vacuum loads, the diaphragm might be opening up more above 2,000 RPM where it can then supply more fuel. But under lower RPM when the vacuum is lower (I've verified this using a vacuum gauge), the diaphragm isn't opening enough to allow sufficient fuel to service the engine at lower RPM's. At higher RPM's, the vacuum pull is stronger, which might be opening the valve more (if not all the way) to allow proper fuel at highway speeds. Again, this is just my theory. What I do know is that the vale is not closing. Remove the vacuum line and the valve should close, and starve the engine once the carbs are out of fuel. This did not happen. This still does not necessarily mean that my floats on the left carb are not bad. Even with a failed valve, with the floats working, the fuel should not be draining into the left intake manifold. So I'm going to remove the carbs and rebuild them; I already have the kit. Plus someone put a larger main-jet in when they had the bike. I have the stock jets. I'll pull the valve off sometime today I think. The seals might be good, but the little bushing that holds the front and rear seal might be stuck from corrosion. Or the front seal might be bad. I feel that the rear larger seal is good because it held under vacuum when I tested it yesterday.